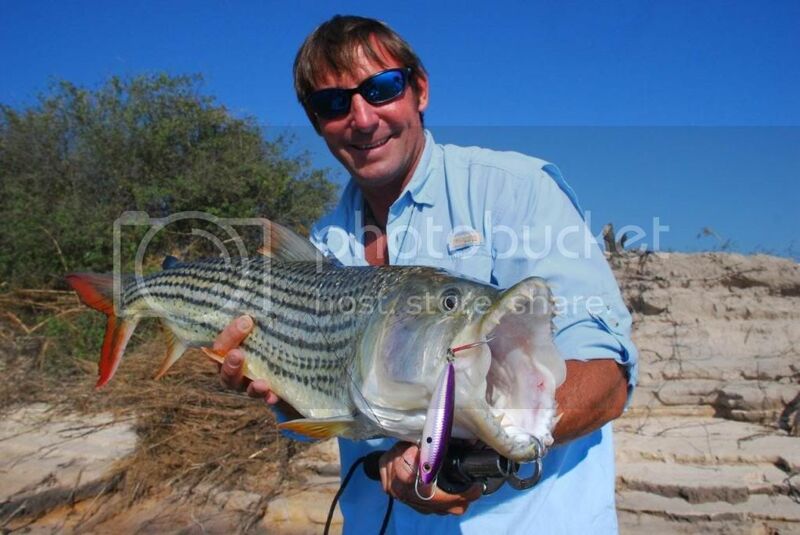 I got back last night from an epic trip to the upper Zambezi, where I stayed at my Friends Gerard Simpson and Graham Williams' brilliant fishing lodge, Barotse Tiger Camp. 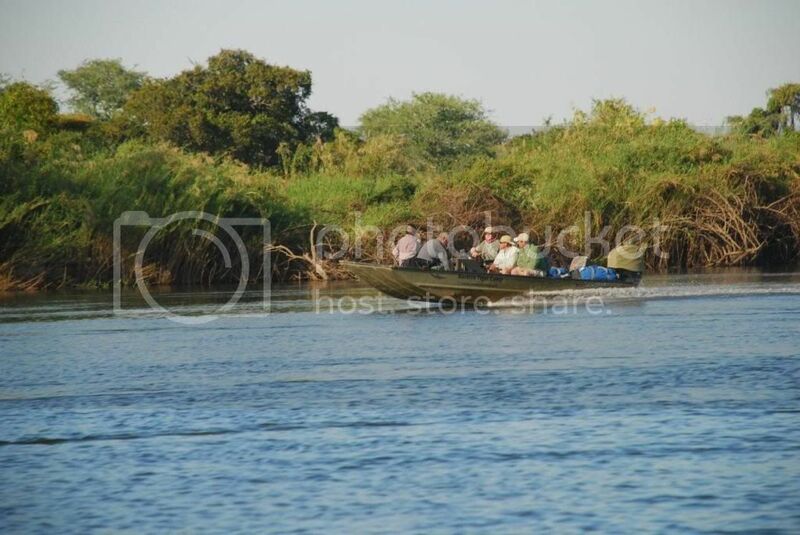 We flew in a charter flight from Lanseria, a two hour flight got us to Livingstone in Zambia, where we cleared customs and then another hour took us to the remote bush strip of Lukulu, where we were met by Gerard and Graham for a boat trip of 45 minutes down river to the camp. 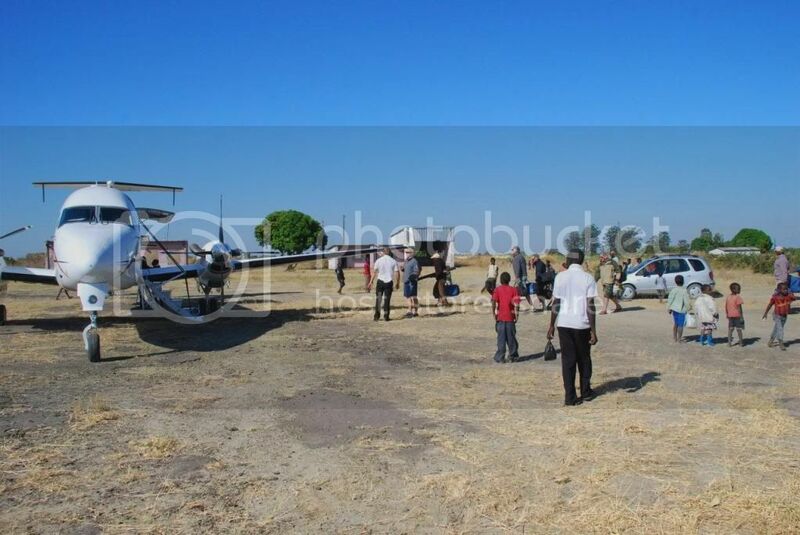 Above is the plane that we flew in, and the curious locals checking out the scene. 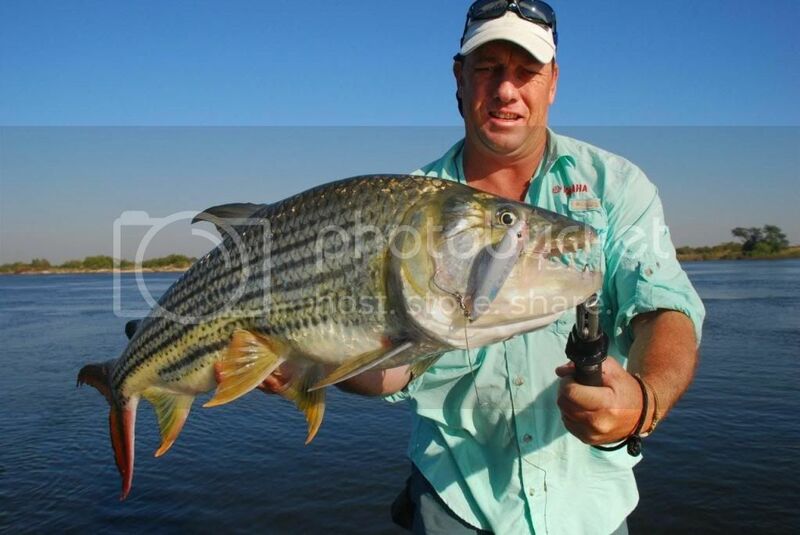 We made our way to the camp and I was pleased to hear from Gerard that there had been good surface activity during the early mornings with tigerfish being quite active for the first few hours of each day in shallower water. I had planned on spending a good few hours targeting these aggressive fish on topwater lures. I have caught a number of tigers on topwater lures in the past, but had yet to land a trophy of over ten pounds on one, so this was my chance! 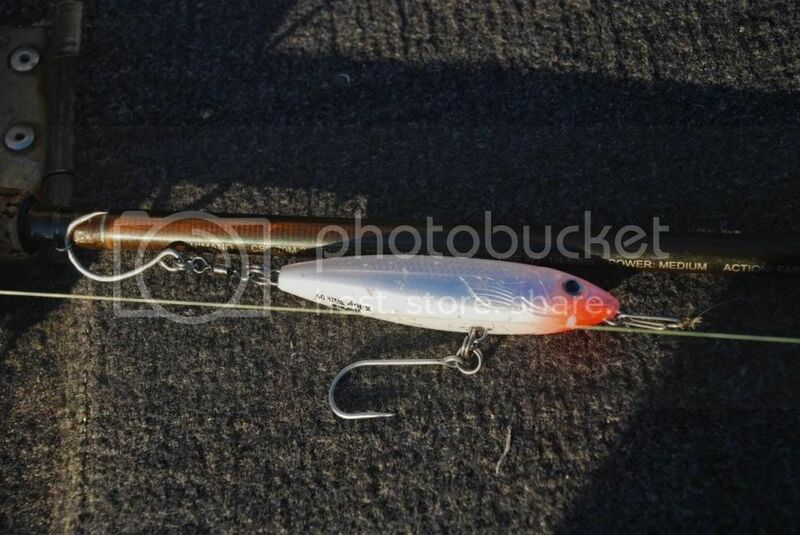 I had rigged up some Rapala X-Rap Walk lures with single hooks, and was dead keen to try them out. These lures have long been one of my number one estuary lures, and I was confident that the tigers would love them as well! Above is a lure rigged the way that I was hoping would be ideal for the tigers. A single 2/0 VMC Siwash hook on the belly, rigged with two split rings to get the hook point facing down, and a 3/0 Decoy Jigging Single, (with the point slightly bent out with pliers to improve the gape) rigged on two split rings with a power swivel in between. 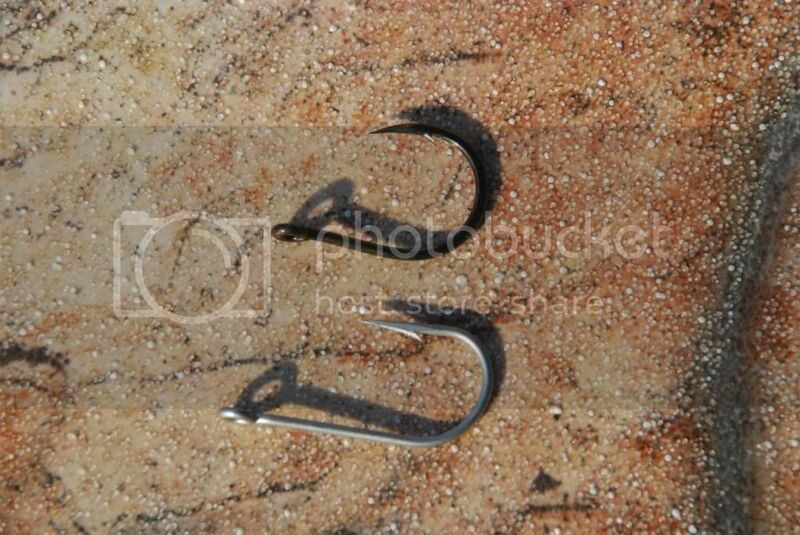 Both hooks are very sharp, and have a nice large eye to give them lots of freedom of movement on the split ring. We were out on the water before sunrise on our first morning, with beautiful conditions and a glassy smooth water surface. 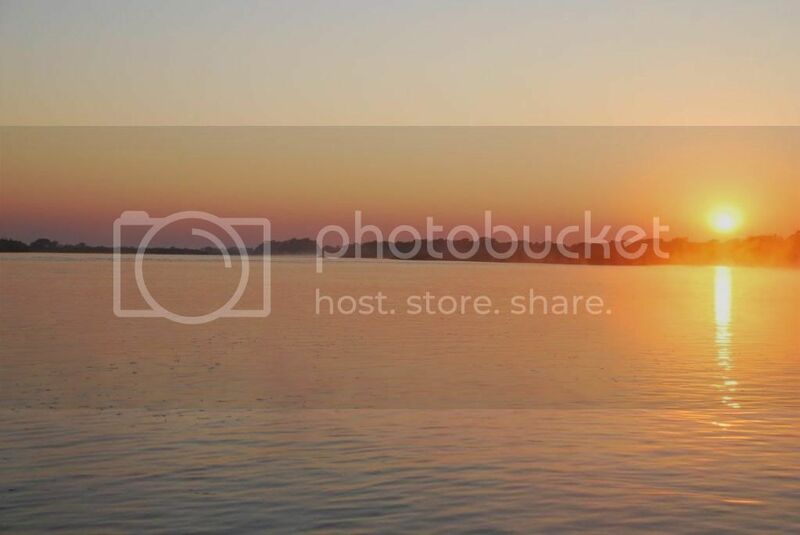 The Zambezi has to be one of the most lovely places on earth to watch the sun rise, while casting a line. We drifted along the banks, right below where the boats were parked overnight. We were casting the lures into every inlet, creek and and eddy formed by the current along the banks, and of course around any tree stucture. We started of getting a lot of small fish boiling and smashing at the lures, as they zig zagged accross the surface. Most of these small fish missed the lures completely, but we hooked and landed a few. Gerard then went tight with a good fish, which smashed his lure aggressively after darting out from a fallen tree trunk near the bank. 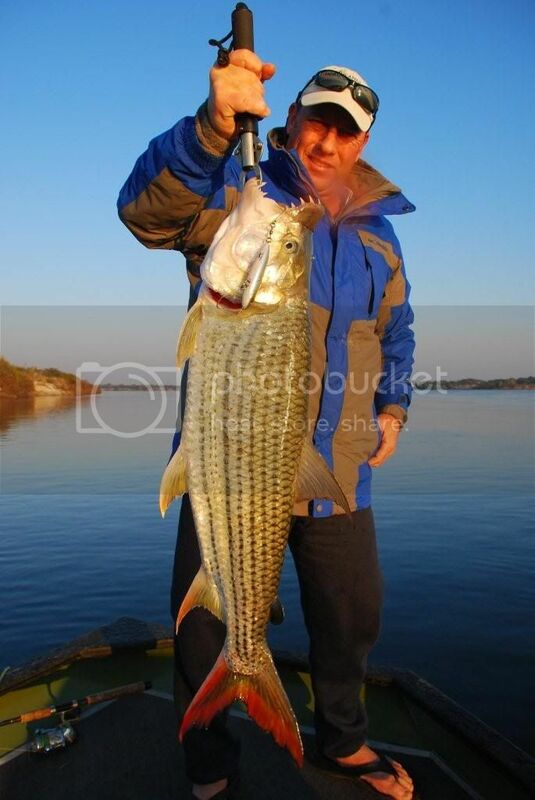 After a hard fight he landed an 11lb tiger on his Orange and yellow Rapala Skitter Walk. A beautiful fish, which gave me hope that I would get one as well. What a beauty, and look at the superb colours on the tail of this fish! I then got a nice 8lb fish, which smashed my lure like a monster, and fought like its life depended on it, but didn't crack the double figure mark on the Boga Grip. Still very enjoyable though, and nothing to sniff at. A bit later Gerard had another massive smash on his Purple and white Skitter Walk, and was in business agian. Thyis time with a 12lb tiger. I was super stoked to see this one, as I now knew that the first wasn't just a flash in the pan. It was just a matter of time before I would get one. The sun had got higher and the surface action slowed down, and around 10am we decided to change over to some copper spoons. I was working my spoon deep and slow over some undulations and drop offs in the middle of the river and was rewarded with a hard strike and a good fight, before landing this 13lb tiger. A lovely fish, which made me happy, but I was till hoping for a ten pound plus fish on the surface. During the afternoon we had an amazing view of some Lozi tribesmen herding their cattle accross the Zambezi, from one bank to the other. 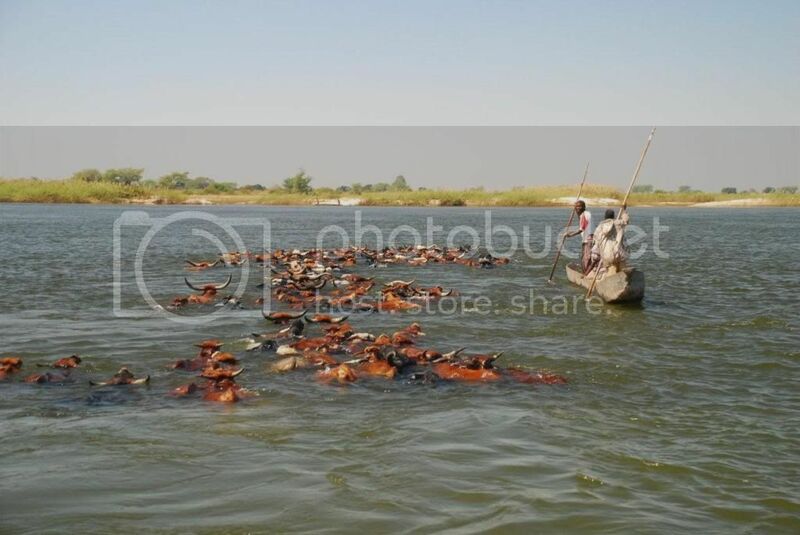 The cattle had to swim, as the water was around 6m deep in that part of the river, and they were accompanied by their owners in a makoro. It was interesting to see that the cattle are actually good swimmers, and made it over with no problems, though we were keeping an eye out for the big crocs that we had seen earlier in the day. The following morning we were out on the water again at sparrows. Conditions were just as perfect as the previous day and I was feeling confident that this was going to be the day that I would get my PB tiger on surface lure. Again we started off with plenty of interest from smaller fish, and I landed anbout three or four fish between four and six pounds, before my lure was engulfed in a massive smash, and my rod pulled flat. The fish jumped from the water and it was clear that it was over ten pounds when we saw it airborne. My heart was in my mouth as I fought the fish, praying that the hooks would stay in. Sure enough I got it to the boat and Gerard netted an 11lb tiger for me. I was super stoked, and couldn't get the smile off my face. About twenty minutes later there was a gigantic smash on my lure and the fish unfortunately missed. I quickly retrieved it back and flicked it back to the same spot and started working it. Three twitches and the water was turned to froth as a huge tiger smashed the lure on the top, her whole back coming out of the water as she hit. She jumped spectacularly three times, each time my heart almost stopped as I expected to see the lure come flying back at me, but she stayed on and I finally brought her to the side of the boat. She weighed 15lb on the boga grip and was an absolutely magnificent fish. The trip went on, with more big fish being landed than I would have imagined possible on surface lures. 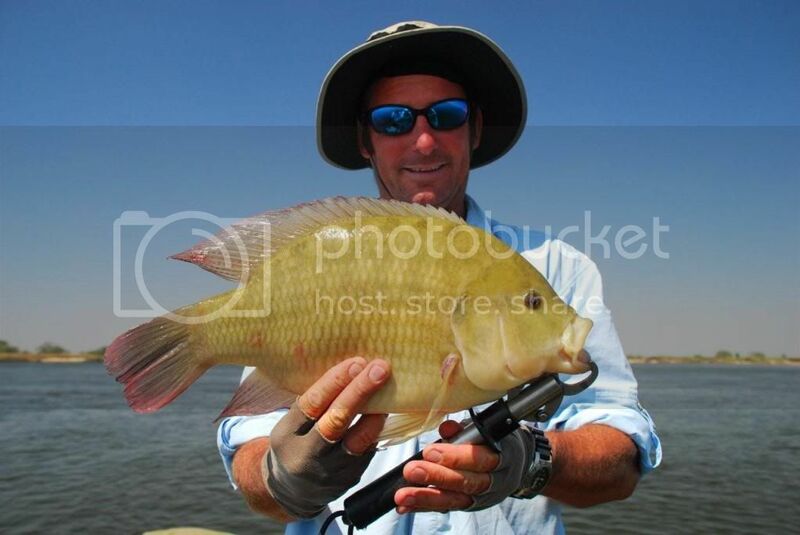 Gerard also landed a very nice specimen of a pink happy bream on a copper spoon, which is reasonably unusual. It was a really pretty fish. I got another 12lb tiger on the X-Rap Walk, which gave me another great fight. 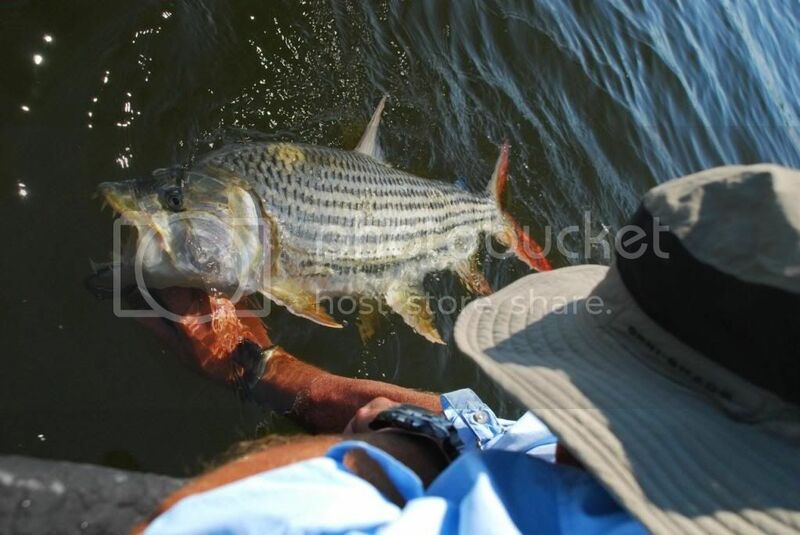 All in all a very succesful trip, with the fish that we after playing the game and allowing us to catch them in a way that very few tigerfish have been caught in the past. 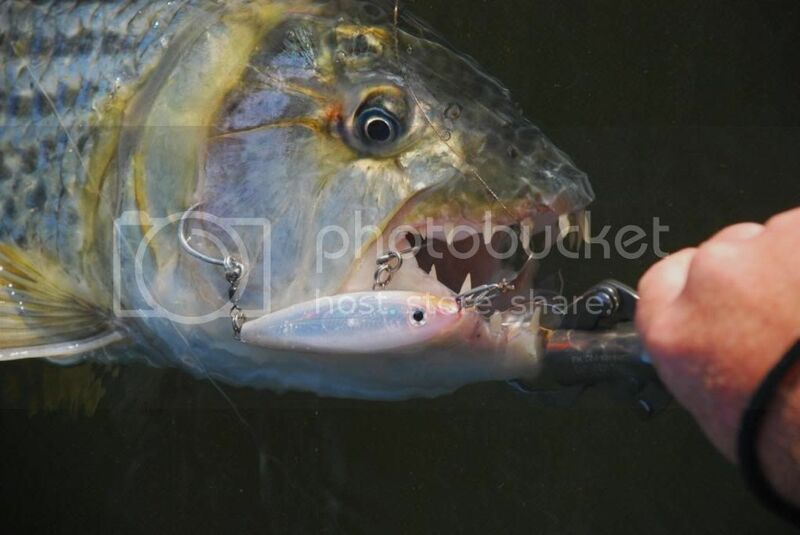 I am dead keen to do more topwater lure fishing for tigers, and am quite sure that this will become a popular method of catching these spectacular fish in the future. Nothing quite matches the vicious smash on a surface lure, and it is incredibly exciting fishing. Yesterday saw us pack up and head for home, but I will definitely be back and I am already looking forward to the next trip. Quality report as always , burning to try my hand at the river dogs . 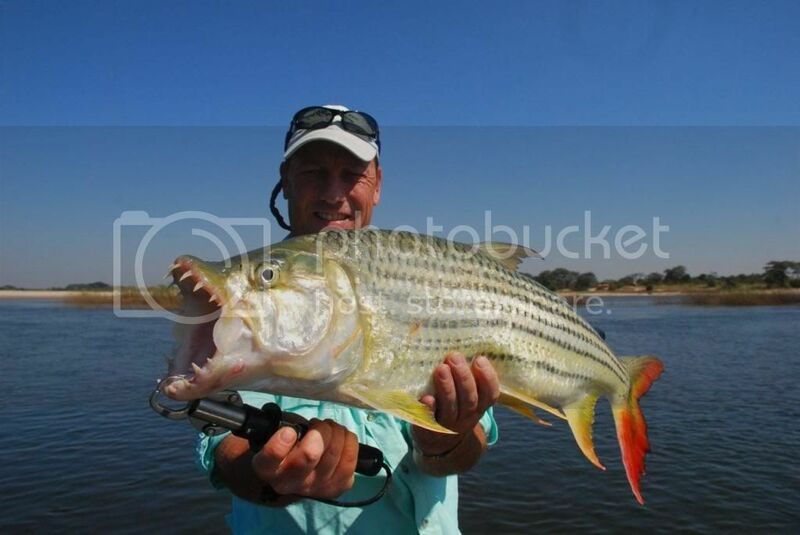 This post is well timed for me - I am planning going to the middle Zambezi (Mana Pools in Zim) in October and was beginning to plan what lures to take - after reading this, I think I am going have to take my credit card for a little stroll to the repository of lures at basil manning! Great report as always Tommo and some great pics. Must be awesome fishing top water for them! Do you rig your stick baits similarly for GT's etc? 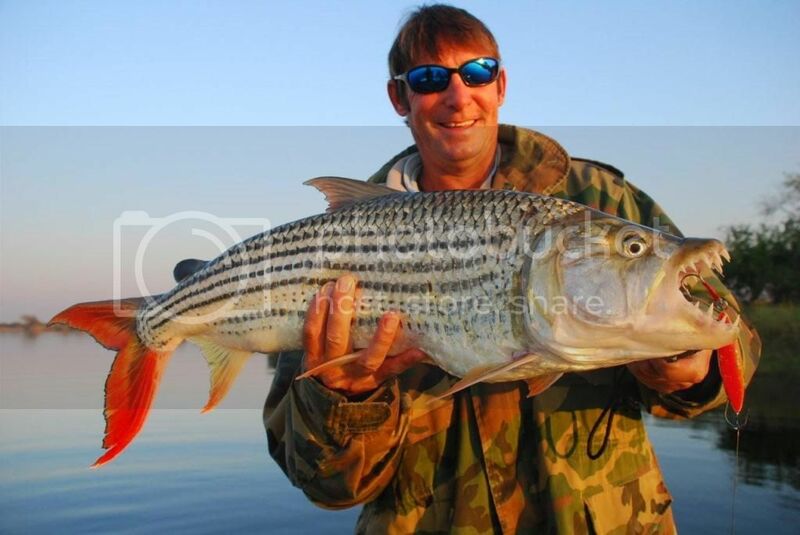 Hi Strandloper, it is definitely amazing fishing for tiger on topwater, spectacular stuff! I rig my smaller stickbaits that way for the saltwater, but the big boys have back to back singles on the belly ring and one single on the back. Tommo - do you use a steel wire trace? I seem to see it in some pics. How long and how rigged? Hi Ziggy, yes I definitely use wire. For the below the surface lures I use Number 5 piano wire (43lb) of around 20cm. I join it to the leader using an Albright knot and join it to the lure with a Haywire Twist. When using this it makes sense to use a strong leader. I use 50lb Sufix Zippy, as the Albright knot onto #5 wire does severely weaken your leader. With 50lb leader and 20lb braid main line I was still breaking off on the Albright when I snagged up on structure at the bottom. The setup is ideal for the big tigers though, and I didn't lose a single fish to a breakoff. For the surface lures I made up some leaders with 40lb Nylon coated wire, with a strong clip on the end, so that I could change lures easily, without cutting my leader. I also joined this to my nylon leader with an Albright knot. The wire traces for topwater I made about 35 - 40cm long, as the tigers often slash wildly at the lure and sometimes miss it by quite a bit, damaging your leader if it isn't long enough. The Albright knot onto the 40lb Nylon Coated is much stronger than that onto piano wire, so you can go with 30lb leader. I use clips that I get from a friend, Dennis Swannell, who makes the best clips I know of. I use the 1mm quick release clips that he makes. He does supply some stores, but they are generally quite hard to find, so I get them from him direct. PM me if you want his number and you could order some directly from him if you would like. I use those same clips for all my light tackle lure angling. Thanks Tommo - I cut and pasted that into my Zambezi prep list! Great report!! Super envious! I had the pleasure of staying there in Sept. 2008 and fishing with Gerrie. Had an unbeliveable trip with some superb fish caught! Biggest of the trip was 21lbs on a copper Effzett with my PB of 12lbs on fly. Superb river and fishery! Itching to head back there! Awesome report as usual. Congratulations on your great catches. Even flying in that plane would get me smiling from ear to ear. Thanks Guys, and Ziggy, be sure to get some VMC Siwash hooks in 2/0, 4/0 and 6/0. These are definitely the hooks that get the best results on tigers. They have a large eye, very sharp point, and most importantly of all, a straight point. They are shaped a bit like a Kendal Round. Most hooks these days tend to have the points bent in, a bit like a hybrid circle hook. 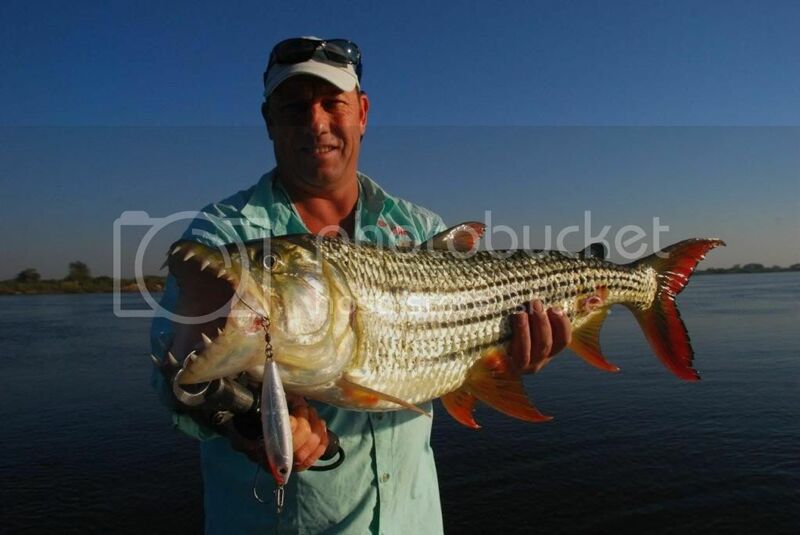 For the tigerfish you want the hook point dead straight, or even slightly bent out. A bit like a traditional sailfish hook. This tiny detail makes a massive difference to hookups with these fish. I spent time with pliers actually reshaping some of my hooks to get the point right. This improved the hookups enormously, as I was missing way too many fish with hooks with their points bent in. The pic below shows the difference between a good hok for tigers and one that will get far fewer hookups. The top hook is great for other species, but very poor results with tigers due to the point shape. The bottom hook is a VMC Siwash, which is ideal. Tommo, have you tried the Gamakatsu B10S? I use this for my flies but not sure if it would be useful for lures? Mustad make a Red Tarpon hook which is the closet I can determine to the B10s albeit it's red. Hi Super_daav. I know the Gamakatsu B10S, it is a great fly hook. Gamakatsu makes a Siwash hook as well that would be better for lures, mainly due to the larger eye, which means it can be fitted on a heavy duty split ring and still swing free. Thx for a great report as always. Enjoyed the read. Great report as always I cant wait for our boat trip in Jan to learn from the pro himself.